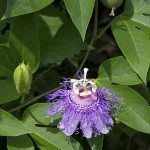 I have a passion flower vine in my garden and it does not bloom. What do I need to do to get it to bloom this season? Too much nitrogen will keep a plant from blooming. Try adding some bone meal to the soil and go light with the regular fertilizer. That should help it to bloom.